According to a report on Gambling911, the world’s second largest poker site Full Tilt Poker, is closing the gap on the world’s largest online poker site, PokerStars. As of November 20th, PokerStars is showing 35,000 cash game players compared to Full Tilt’s 21,000. 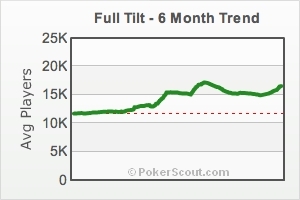 On Monday of this week, Full Tilt closed the gap on PokerStars to just over 5,000 players (26,695 to 21,180) as shown on online poker traffic and ratings site, PokerScout.com. 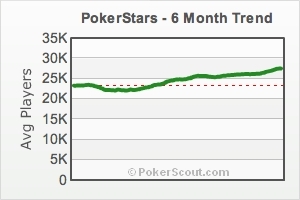 One could deduce from the latest 6 month trend that Full Tilt may catch up to PokerStars in the near future. If Full Tilt continues to sign top name online pros like Tom “Durrrr” Dwan and continue to extend their market reach overseas, we may one day name Full Tilt, the World’s Largest Online Poker Site. 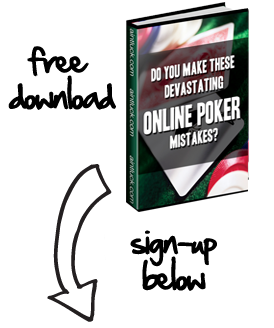 I guess PokerStars would need to come up with a new slogan.